There are numerous products on the market, but we’ve found that Jasco works really well. This product is readily available at any hardware store. When working with this product, you must wear hand and eye protection. This is a very hot solvent. It burns if you get it on your bare skin. Make sure you are working in a well-ventilated area because the fumes are highly toxic. Use a tungsten carbide scraper to remove the disintegrated finish. The more finish you can remove from the real wood kitchen cabinet doors-the better off you will be. Be very careful to not gouge the material you are working on. Always scrap with the direction of the wood grain. If you go against the grain, you will most likely gouge the wood, creating a need for doing a wood-patch repair. Tip: If you think you want the rough rustic look, try distressing the wood cabinet doors prior to moving to the next step. 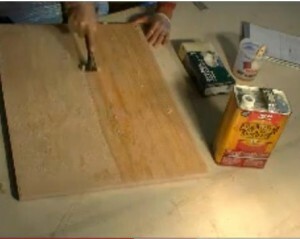 Start with 100 grit paper and progress to 220 by using 180 grit between applications. 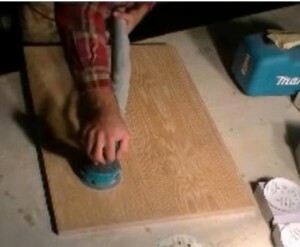 A vibrating sander is ideal for this step of refinishing the wood cabinet doors. You want to be certain that you use minimal pressure if you are working on a plywood veneer door like the oak one in the video. Veneer is very thin and can get damaged of too much pressure is used. If you are working with a solid real wood door, you can apply more pressure. If you were finishing unfinished cabinet doors you would begin at step 2. There are many wood conditioners on the market. A good one is Varathane Wood Conditioner because it dries fast. You can apply this with a brush, but I like to use a one hundred percent (100%) cotton, lent-free cloth. Pour the refinishing product into a container and wipe a thin coat on quickly. This liquid has the consistency of water and will go on very fast. The drying time will depend upon what the temperature of the room is. You should never place wood kitchen cabinet doors in the sun to speed up the refinishing process. After the finish is dry, use triple zero (000) steal wool over the entire finish. The steal wool will remove the small rough particles that are on the wood kitchen cupboard door. Clean the surface well with a tack cloth. Apply a coat of the stain with another one hundred percent lent free cotton cloth. You can apply a fair amount of pressure in order to press the liquid into the grain of the wood doors. Wipe off the excess stain after it has been allowed to briefly soak into the wood cupboard door. Let this new finish have plenty of time to dry. Drying times vary with different brands. Most products require four to eight hours before you can work with the kitchen doors again. Tip: Consider changing the cabinet door hinges while you are remodeling your kitchen cupboards. Once the stain is completely dry, lightly go over all of the surfaces with 000 steel wool again. During this step, you should be wiping with the direction of the grain. You can use a tack cloth or air air pressure to clean off the surface in preparation for the final top coats. One of the most important things to be aware of during this process is the condition of the atmosphere. You do not want to have a bunch of dust particles floating in the air during this step of the refinishing process. Your wood kitchen cabinet doors will look awful with a bunch of little dust particles in the final finish. 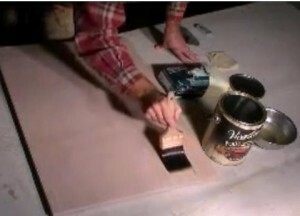 The author of this Youtube video is using a four inch (4″), hand-crafted, synthetic paint brush, made by Purdy. Apply the finish with a lot of brush strokes. It should feel as though you are pulling the clear coat off, but in actuality you are not. Allow the first coat to dry for twenty four hours and then lightly go over it with steal wool again. Wipe it clean with the tack rag and apply the second and final coat. 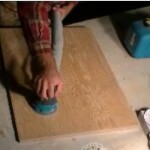 This five step method can be used for refinishing any type of real wood. It doesn’t matter of the species is oak, cherry, maple, walnut or birch, this wood cabinet door refinishing process will work. This is the most important tip I can offer you, take your time and do this right. If you do, your kitchen cupboards will look stunning when you are finished. Thank you for your generous “gift of time” showing and explaining how to refinish an oak cabinet door with a whitewash stain. Well done!